Those of you haven’t seen it probably have seen the remake with Kevin Costner called No Way Out. I saw the Costner film first and as much as I love that film I find the original more satisfying, if more fantastic. 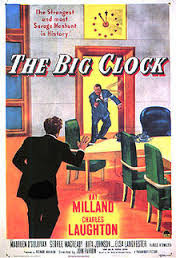 The plot of The Big Clock has Ray Milland as the head of a crime magazine run by Charles Laughton. The specialize in finding lost fugitives. When Milland quits he ends up spending a night drinking with the boss’s mistress. When Laughton kills her he tries to frame a shadowy figure he saw leaving her apartment (Milland). Milland is given a huge raise to come back and try to find the figure. Milland has to cover his tracks while everyone is pushing for an instant solution. A tense mix of humor and suspense the film the film is a beautifully crafted thriller. Where the film at first sends us far and wide through New York and has talk of cities around the world the film closes in in the final piece as Milland and all the characters are essentially trapped in the magazine offices as Milland tries desperately not to be recognized. The shift makes it all feel incredibly claustrophobic. There are so many delights in the film I could wax poetic about it for hours, however I won’t since you should just see the delightful film for yourself. However I will say that the film has a great, wordless turn but Henry (aka Harry) Morgan, best known as Col. Sherman Potter on MASH. He’s absolutely chilling and he doesn’t actually do anything except stand there. One of the great films of the 1940’s.